When you participate in a Team NPF Cycle event, you’ll have a wheel good time raising funds for a cure for psoriasis and psoriatic arthritis. Dream big. Pedal hard. Find a cure. Click below to join a Team NPF Cycle in your area. 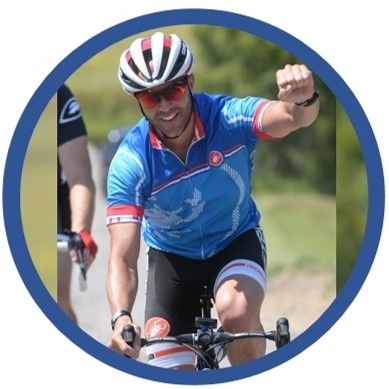 "Getting involved with the National Psoriasis Foundation and taking part in this ride meant a lot to me. Hopefully together we can help make a difference and maybe even find a cure." Don't see a cycling event for you? Register as a Virtual Rider and be part of a Team NPF Cycle event no matter where you live. Raise the minimum $200 or more and you will be eligible for all event incentives and prizes. Choose your favorite local route and ride, and join hundreds of others riding “For a life free of psoriatic disease”. Interested in having us start a cycling event in your community? What’s that up in the sky? It’s a bird! No, it’s a plane! No – it’s you, our Psoriatic Psuperhero! If you are living with psoriasis and/or psoriatic arthritis, let us make a fuss over you at the Team NPF event in your area. In honor of your efforts to live well with psoriatic disease, all Psuperheroes will receive a limited-edition jersey and other special benefits on event day.